This one's for Zorra to help her feel at home and celebrate 'Swiss National Day'. After much deliberation, I decided to go with a Risotto and a Gratin. Both turned out to be really easy to make and were bursting with flavour!!!! Saffron Risotto is a typical dish from Ticino - the Italian speaking canton of Switzerland. Here I have modified a traditional recipe I learned from my aunt to add peas. The result was a very fresh flavour to an otherwise rather delicate taste. 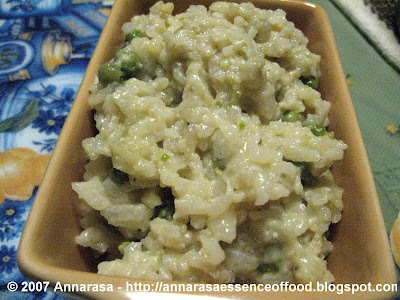 Risotto is traditionally made with Arborio rice which is an Italian medium-grain rice. Named after the Italian town of Arborio where it is grown, this starchy rice has rounded grains which are both firm and creamy. I managed to get the rice from my local supermarket but was not sure of what Swiss cheese I should get - so I went with Parmesan, the pungency of which set off the sweetness of the peas. Pour the oil in a medium sized saucepan. Add the onions, and fry until transparent. Next add the peas and cook for 5 minutes. Pour the rice and fry along with the peas and onions until it is translucent. Keep stirring to keep it sticking to the pan. Pour in the warmed wine, stirring constantly. Once the wine dries, add a ladle of the vegetable stock, allow it to be absorbed by the rice, but add another ladle just before it dries up. Continue cooking the rice, stirring it and adding the broth as it is absorbed by the rice. Once the rice is fully cooked, stir in the salt, saffron, and grated cheese. Cover the risotto, and turn off the flame. Let it sit for a couple of minutes. Serve warm. Risotto looks delicious!! The pic is inviting! Now I'm hungry! It looks so delcious! Regarding the cheese you could use Greyerzer or Appenzeller, but Parmesan of course goes well, too.